Nafion® membranes are often used to separate the anodes from cathodes in electrolysis reactors or fuel cells. The thickness of the cation exchange membrane makes Nafion® 117 ideal for methanol fuel cells (DMFC). Nation® 117 is 183 μm thick. Chemours® (formerly DuPont®) Nafion® 117 membranes are unreinforced films based on chemically stabilized perfluorosulfonic acid / PTFE copolymer in its acid form (H+). The physical properties remain the same for the chemically stabilized membranes. Compared to the unstabilized polymer, these have a much lower fluoride ion release. This means improved chemical resistance. Nafion® PFSA membranes are widely used for proton exchange membrane (PEM) in fuel cells and electrolysis reactors. The membrane acts as a separator and solid electrolyte in a variety of electrochemical cells. Typically, such cells require that the membrane selectively carry cations across the cell boundary. The polymer is chemically resistant and durable. We offer different versions of Nafion membranes. Please ask for an offer. 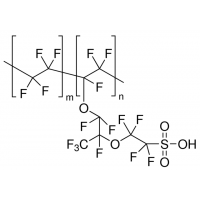 Nafion® 117, ~5% in a mixture of lower aliphatic alcohols and water by Sigma Aldrich.Quantity 25 mlP..
Nafion® membranes are often used to separate the anodes from cathodes in electrolysis reactors or fu..